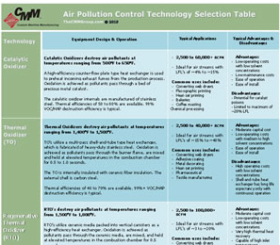 Energy Recovery Systems from The CMM Group can be incorporated into new air pollution control systems (APCS) (or other high temperature emitting devices) or be retrofit or added to an existing process. 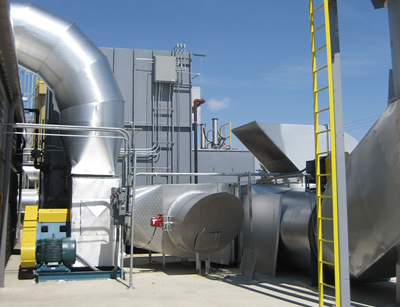 Energy recovery systems utilize the 100°C (212°F) to 815°C (1,500°F) of heat energy (depending on the heat emitting technology in use) that would normally be exhausted directly into the atmosphere through an industrial ventilation unit. An air-to-air secondary heat exchanger can be an extremely efficient low cost solution to capturing heat from an exhaust stack. The heat exchanger can be designed for minimal pressure drop so as not to affect the operation of the upstream system while returning temperature controlled fresh-air back to the facility for a variety of uses. This heated and filtered fresh air can be used for building comfort heat, process make-up air (ovens/dryers, kilns, curing zones, etc. ), or in some cases, can completely replace the need for natural gas fired burners and/or electric heaters within the manufacturing process itself. An air-to-liquid primary heat transfer coil can be installed within the equipment exhaust stack to capture heat from an exhaust stream and provide hot water, glycol or hot thermal oil. Using secondary air-to-liquid or liquid-to-liquid coils with an integrated liquid pump skid (and an insulated control loop) the heated liquid can be used throughout a facility for building comfort heat, process make-up air (ovens/dryers, kilns, curing zones, etc.) or to provide supplemental heat to boilers, hot water wash systems, etc. Depending on the exhaust stack temperature, the exhaust from the process equipment could also be routed directly to a low-pressure waste heat boiler. If the facility uses steam for any reason (carbon bed regeneration, cleaning, humidity control, etc. ), this system could supplement steam production capacity anytime the system is in use. In an ideal situation, the steam produced from the exhaust would allow the main steam generator to function only as a back-up system. Another option is to install an adsorption chiller in the exhaust stream. Many companies use chilled water for various reasons (air conditioning, chill rolls, condensers, etc.) While the initial capital cost is higher than a conventional chilled water system, the “free” energy provided (from the oxidizer exhaust) to run the system can make it an economical choice for a waste heat recovery system.